Getting the perfect Valentine's Day gift for a man can be quiet a task. For a woman there are like a million choices available, but for a man the options get so limited, and then you've got to match it with his taste, his personality type and so on. So to make it easier for you, we've put together a list of gifts for men that would appeal to all men in general. With most of these gifts you don't have to worry about going wrong. A gift basket is a great choice because there's assortment of gourmet food, snacks, crackers, beverages and things men love to eat and drink. Choose from a range of edible delights including nuts, snacks, crackers, chocolates, popcorn, beer, wine, cheese and more. Watch him splurge on the food while enjoying a game on TV; you would practically own this man already. 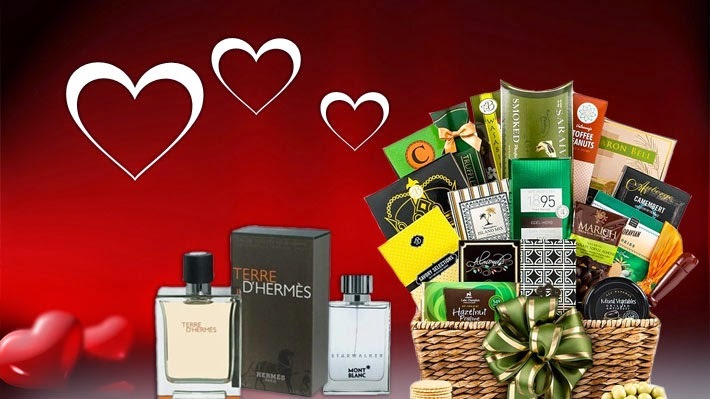 Choose the perfect gift basket for your man from the link below and get savings on your purchase. And here's where you can get good deals of gourmet gift baskets. This may sound cliché, but it works all the time. Nobody can have enough of perfumes. Make it more romantic by picking a fragrance of your choice and let him know how delightful it is being close to his fragrance. Here's a link to help you choose and save on perfumes. Here's something naughty, yet intensely romantic, personalized boxer shorts. Get his name printed or yours, or even better, get a naughty message printed. Perfect for Valentine's Day! Choose your pick and get discounts. Click on the link below. Believe it or not, Victoria's Secret has some of the most exquisite gift sets for men. And men, contrary to the popular belief, love to pamper themselves. Hence the term, metrosexual! Get perfumes, colognes, creams and more. Here's the link to get you discount on your gift. Okay, this may sound clichéd too, but branded sunglasses in the latest style won't hurt a man, especially if it's been a while he got himself a pair. Here's your link to a great collection with greater discounts. The gift is important, but even more important will be the feelings. So just wrap around a lot of warmth and thoughtfulness around that perfect find and celebrate your love. Happy Valentine's Day!